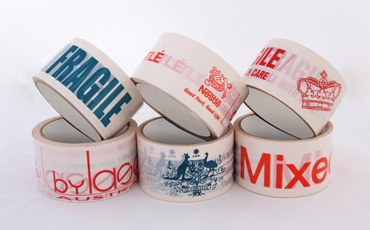 We are manufacturers of customised printed sticky tape. We have been manufacturing printed adhesive tape since 1996 in our local Sydney warehouse. We are a family owned business and pride ourselves on our commitment to service at very competitive rates. We can tailor make a package to suit your company's individual needs. To simplify the process for all our customers we take your ideas, or artwork and in a few simple steps, your printed tape is printed and delivered. No job is too small and we can print minimal quantities. So if you are just starting out or if you are a large corporate company, our +15 years of experience means that we can cater for your next project. What are benefits of custom printed tape? Be noticed - Brand awareness is important in today’s market. Cost effective – not only are you buying directly from the manufacturer, but your designed tape can be made for multiple uses. Incorporate your brand with fragile or handle with care warnings, eliminating additional labelling and custom printed cartons. Security – use our product as a SECUTIY SEAL. This is common use for a large proportion of our customers providing an effective way to secure parcels and prevent tampering. Many uses - Our high quality printed tape is not only used for sealing cartons but for many other uses such as labelling items, colour coding products and exhibition displays. "The tapes came today. They look amassing… Thank you so much, Great work and quality"
"Thank you so much for getting us onto the custom printed packaging tapes. Not only have they made our shipments look much more professional, our goods are now easily identifiable! As an added bonus the tape is of such high quality we find ourselves using less tape." Our sizes range from 12mm right through to 100mm and we can print up to 3 spot colours on white or coloured tape. We can also supply you with perforated and laminated custom printed tape, being a cost effective product compared to printing individual labels. Let us work out a package deal for you! For more information or an obligation free quote please call 9758 0211 or email your enquiry to speak to any of our friendly staff.